You have to see it… the world is changing at breath taking speeds right before our eyes. And this story is a perfect expample of how these changes are affecting the very fabric of our livelihood. A U.K. court has Tweeted an injunction for the first time ever. Saying that Twitter offered the best means of contacting a suspect accused of impersonating right wing blogger Donal Blaney. 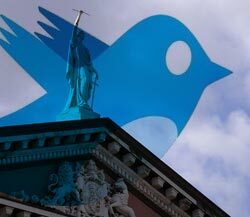 The high court in Britain, in sending out the court order via Twitter, has forged a new frontier in the way the court communicates with the public. This court order issued via Twitter is also a strong message for all of the impersonators out there who think they can meliciously produce content as someone they’re really not. The accused online impersonator will get a message from the court the next time he or she opens the rogue Twitter account, detailing the writ. Prosecutors and legal experts hope that this step taken by the High Court represents a new way to bypass the anonymity of the Internet that so many impersonators and fraud experts hide behind. Regardless, this step taken by the high court in Britain is just another example of the way that technology and social media are integrating in our day to day lives.